TAS Professional powered by CAS is the best kept secret in programming today. TAS Professional is a powerful 4gl RAD business programming language using both Btrieve (pervasive) and Codebase for all database functions. We added more database using the new SQL(). Take a short screenshot tour of TAS Professional. X-change Credit card processing for TAS Professional Now integrated click here for more details. NEW third party tool to use Excel and Open Office Calc to update or create .xls files using TAS 7. See there website now. NEW TAS2XLS.DLL and TAS2EXCEL.DLL Now add graph support to your TAS pro programs. Advanced Accounting 7 Powered by CAS and TASPRO 7. now in the download section. Spell Checking both in the IDE and in your compiled programs. Both Codebase (Dbase) and Btrieve (Pervaisve) databases are supported. 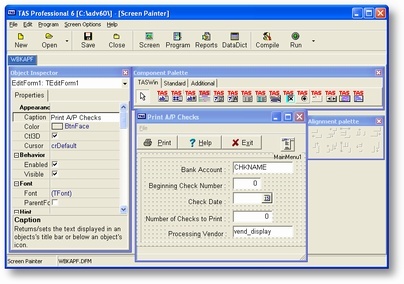 Automatic MDI (Multi Document Interface). NEW SQL Function that give you access to SQL databases and commands. NEW updated DOCS in .CHM .PDF and Complete Docs here on our website. Click here for our online docs so you can see how complete this Windows programming tool is. Ver. 7.8.1 added a new property to the TasDataGrid AltColorRows Also more work on this object to make a better user experience. TAS Professional includes over 150 commands, each with many options, and over 230 functions that can be used in expressions. Many of the TAS Professional commands and functions can be compared to macro functions found in other high level languages. In other words, a single TAS Professional command can often replace several entire lines in other languages. Add to this the ability to create User Defined Commands (UDCs) and User Defined Functions (UDFs), Libraries and includes and you now have a very powerful development tool set for today's rapid development programming. The great part of this programming tool is it's all there you do not need to purchase more tools. Programs take no time at all to to complete. If you have any questions about our software please feel free to email us or call.